A government researcher applies sealcoat at an Austin, Tex., test site. 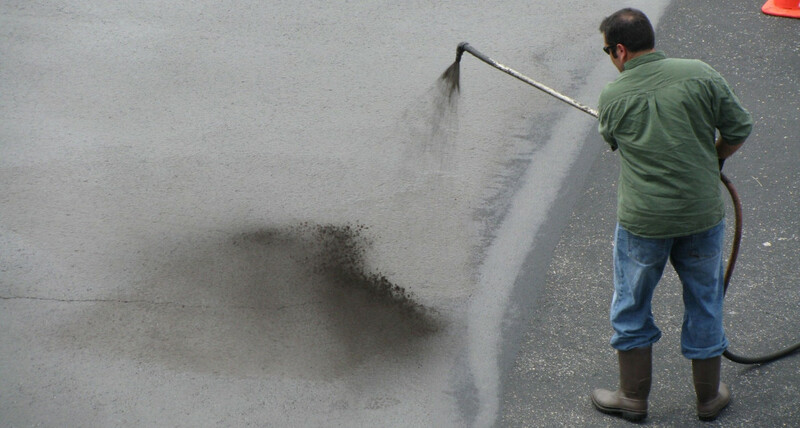 Coal tar is known to cause cancer in humans. That finding dates the 1770s, when chimney sweeps in London were found to have high levels of scrotal cancer. Late the next century, it was associated with skin cancers among creosote workers. PAHs themselves are listed by the U.S. Environmental Protection Agency as a probable human carcinogen, based on laboratory studies in which they caused cancer in animals. The path that led to the discovery of the toxic dirt inside Americans’ homes traces back to a tiny creek in Austin, Texas. A series of scientific studies followed. Scientists from the U.S.G.S. Texas Water Science Center involved in the Barton Creek findings measured pollution in lakes around the country, noting an increase in PAHs. In the next phase of their inquiry, they swept up dust in parking lots in Seattle, Portland, Salt Lake City, Minneapolis, Austin, Chicago, Detroit, Washington, D.C. and New Haven, Conn.
“Just because we live in urban environments – and most people do live in urban environments – doesn’t mean they have to be polluted,” he said. Washington is poised to become the first state to ban a toxic asphalt sealant made from industrial waste because its ingredients are turning up in ordinary house dust as well as in streams, lakes and other waterways at levels that concern government researchers.